My cat Millie loves her treats. I always buy her the same brand in the supermarket but are they the best for her? No they’re not. 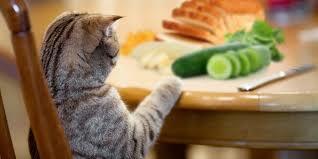 There is a way that you can provide your cat healthy, tasty treats. You can make them yourself. With all of the artificial fillers and grains sneaking into mainstream cat food these days, it is important to make sure that your cat is getting the proper nutrition he needs, as well as adding some fresh ingredients into his diet. Vitacost.com have some provided some healthy cat treats that are easy for you to make at home. I will also give them a try! Boil (or microwave) potato until well-cooked and tender, about 5 minutes. In medium bowl, mash the potato using a fork. Shape mixture into bite-sized patties and place onto baking sheet. Bake for 10-15 minutes until slightly browned and crispy. Store refrigerated in an airtight container. In blender, combine all ingredients, adding in the coconut flour slowly. Blend until dough resembles dry cookie dough. Form dough into small bite-sized pieces and place onto baking sheet. Bake for 10-15 minutes. Store refrigerated in an airtight container. Edgewater Gold Radio is your station for the best oldies of all time! Music for the baby boomer generation 50s 60s 70s and 80s all the time! Listen from our webstie: Edgewatergoldradio.com or download the free Edgewater Gold Radio app from your app store. This entry was posted on Monday, November 26th, 2018 at 10:10 am	and is filed under Pet Supplies. You can follow any responses to this entry through the RSS 2.0 feed. Both comments and pings are currently closed.